« Taxed to the Max: The Invisible Middle Finger of the Hand that Moves the Markets. I’m writing about this amazing play just in case it gets extended, in which case Spooky and I are taking a little road trip. New York is abuzz! 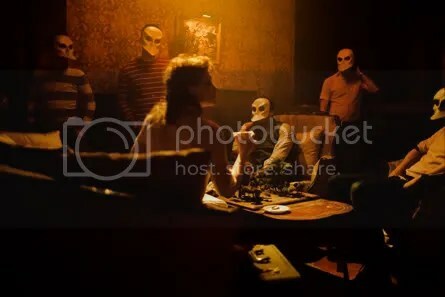 Sleep No More is an immersive theater experience, a (very) loose adaptation of Shakespeare’s MacBeth created by the London theater group Punchdrunk. The audience is required to wear Venetian-style trickster masks and wander wordlessly though a warehouse temporarily transformed into the McKittrick Hotel, a creepy 1930’s multi-roomed stage filled with dancers and actors interpreting various scenes from the play. Visitors are able to wander the rooms at will and touch the exquisitely detailed props to their hearts’ desires. Thus immersed the audience becomes more witness than watcher of the passionate and bloody goings-on. Sleep No More looks like something Stanley Kubrick and Alfred Hitchcock would have concocted had they met for drinks one night, so of course I want to see it. Unfortunately I hear that as of a few days ago it was nearly sold out, and now that it’s getting rave reviews everywhere from the New York Times to Vogue Magazine I doubt Spooky and I will be able to find tickets. Maybe Punchdrunk will take the show on the road . . . uh . . . just imagine taking a 93-room stage on the road . . . hmmm . . . nevermind. Our only hope is for it to eventually turn into a classic, the way Phantom of the Opera and Cats did, so theater-goers can see it whenever they want.